Okay, okay, okay…I know what you are thinking. How is it possible that you have lived in New York State for 46 of your 56 years and never before been to New York City? Honestly, it’s not that I didn’t have the desire to go. I would have visited years ago, but we have always been busy spending limited vacation time and dollars doing other things, often with family or events involved. We have visited other cities, some several times. New York City called, just not as loudly as the others. So when our daughter announced she would be moving there, the Big Apple was ripe for picking. All cities are expensive, but we went in knowing that we had a limited amount of time and a limit on what we could spend, so we made some careful choices. Our first and I would add, excellent, decision was to find lodging through Airbnb. We wanted to stay in Brooklyn since that’s where our daughter would be living. We found a wonderful little efficiency apartment in a very nice, quiet, neighborhood just a short walk from the subway for just $100 a night. We have stayed in far worse places for far more money. Our host was a kind and very friendly woman from Trinidad who could honestly be a Brooklyn tour guide. She was tremendous and her place was perfect! This was our first Airbnb experience and it was wonderful. We chose our itinerary carefully. If you want to go to New York for the food you can choose from thousands of fabulous restaurants. If you want theater there is plenty. If you want museums take your pick. If you want shopping it’s all there. What we really wanted was atmosphere, and most of that comes either free or really cheap. My first view of the Statue of Liberty was looking out the window of the café at IKEA Brooklyn. We went there the first night after moving our daughter’s stuff into her apartment, since there were a few more things she needed and couldn’t bring from home and we were looking for a cheap dinner, anyway. The statue took my breath away, even looking from IKEA. When we finished there, I drove through the cobblestone streets of Red Hook to get a better view of Lady Liberty. Honestly, that view alone was worth the long drive that whole day. It gave me pause to think of my ancestors coming from Italy, Ireland, and Denmark to find a better life in America. On our first full day we hopped on the subway with our daughter and took the 30 minute express train to Grand Central Terminal. From the moment we walked into the building I was in awe. The building is more beautiful than its photos. The celestial barrel ceiling is grand and gorgeous, and the details around each window are impeccable. From there we walked out onto Park Avenue and up 42nd Street for a quick sandwich at Pret a Manger (use the French pronunciation: pret-ah-man-zher), a chain of delicious and freshly made items where lunch was just $24 for all three of us. Again, we weren’t there for the food, just the atmosphere. 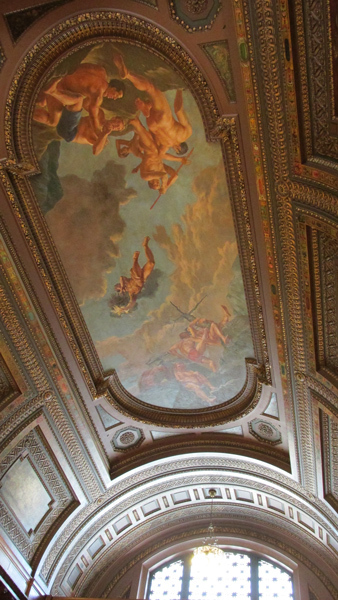 A brief hop away was the elegant New York Public Library. I could live there: stunning architecture at every turn starting with the twin lions out front to the marble stairwell to the hall of Astors (all of the John Jacob Astors and relations who were the original patrons of this fantastic building); rows and rows of books; paintings, sculptures, and historic artifacts galore! Our only disappointment was that the original Winnie the Pooh and friends who live there and are usually on permanent display were out for much needed repair. The Readers and Writers Shop at the library was compelling me to purchase something, and I left with a lion printed book tote. We strolled through Bryant Park and along 42nd Street to Broadway then made the trek through Times Square. Our daughter said, “Hold on to your wallets, we’re going in.” Times Square is what everyone loves to hate about America. It is the pinnacle of crass commercialization: loaded with advertising for everything from high end cosmetics to low-end tee shirts. The hustlers are everywhere including the infamous “naked cowboy” and his really-too-old-and-saggy-to-be-doing-this female counterpart who needed waaaaay more than pasties, but I guess she must think she’s still young and attractive. The fashionistas strutted in Manolo Blahnik’s. The homeless sat on the sidewalk waiting for someone to drop a few bills into a plastic cup. New York provides a glimpse of humanity in all forms from the glorious to the grotesque. The one great thing about being a tourist in New York City is that you don’t have to feel weird about it, because so many are doing the same thing. Everybody’s got a camera or a phone in front of their face snapping photos. We walked back toward 6th Avenue, stopped briefly to drink some water and people watch outside the Wall Street Journal building, and then walked on to Herald Square and Macy’s. If you’re a fan of Miracle on 34th Street it’s a must do, and the still in use original wooden escalators are a fun little diversion. A short subway ride away was the iconic Flatiron Building. As a devotee of interesting architecture, this was a must-see for me. The wedge shape and interesting Beaux Arts look of this office and retail building did not disappoint. Back onto the subway, we headed south toward Greenwich Village. We enjoyed the cooling shade of Washington Square Park and watched the college students and leftover hippies. As I drank the last drop of water from my bottle on this 90-degree day, I could see an elderly Chinese woman making her way through the trash bins in the park and picking out bottles and cans to add to the bales she was pushing on a cart. In New York State those bottles and cans are worth a nickel each. She passed by our bench, and I held out my bottle for her to take. Her gratitude was palpable. She muttered a thank you in broken English with a huge smile on her face. I got the sense that she doesn’t often get that type of ordinary, personal donation. We watched children playing in the park’s fountain and listened to street musicians, then got back onto the subway and headed toward the Financial District. On the Brooklyn Bridge, looking towards Brooklyn. The sign speaks volumes. 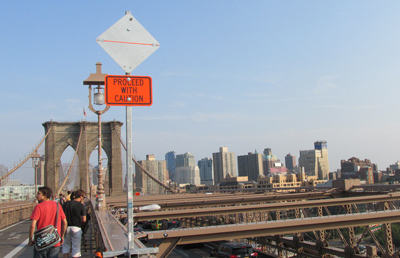 Walking the Brooklyn Bridge was absolutely, positively, worth every moment and step. Car traffic moves along the lower level, and up above there is a pedestrian thoroughfare with a lane for walkers and a lane for bicyclists. You can step into the biking lane for photos, briefly, if you look both ways to make sure no cyclists are headed your way. They go fast and may or may not ring a bell to let you know they’re coming. Luckily you can usually hear them coming on the wooden bridge walkway. The views are exceptional on all sides: from the Manhattan skyline to Battery Park to the Statue of Liberty and Governors Island. The bridge, itself, is a work of art and a feat of cabled suspension engineering that you can’t believe was even possible in the late 1800’s. At the end of the walk, a delicious pizza was our reward at Grimaldi’s in the famed DUMBO neighborhood (Down Under the Manhattan Bridge Overpass). A couple of notes about getting around: We walked almost seven miles in one day, so wear very comfortable shoes. For subway rides, get the $30 unlimited Metro Pass and you can get off and on as many times as you like. Sadly, our plans for Day Two did not work out. On that day our daughter was heading to her new office for the first time so we struck out alone to explore the Metropolitan Museum of Art, stroll through Central Park, and visit Rockefeller Center. We planned to meet our daughter for dinner, and then visit the 9-11 Memorial together in the evening. Due to the fact that I have a wretched esophagus condition that sometimes causes extreme pain and gets worse under stress, we had to scrub those plans. The pain came on suddenly toward the end of the subway ride uptown. We ducked into a nearby Barnes & Noble hoping it would ease up, but it didn’t, so we rode the subway back to our room and I spent the day in bed. Ugh. I am fortunate that most of my days are good ones, but the occasional bad day seems to come at the worst possible times. I have wanted to see the Metropolitan Museum of Art since I was a child and read From the Mixed-Up Files of Mrs. Basil E. Frankweiler. The book is about a brother and sister who run away from home, hide out in the museum, and find a mystery they must solve. The book made that place come alive in my mind and it still fascinates me. We will definitely make plans to visit again since those sights are still on my list, as is the Frank Lloyd Wright designed Guggenheim Museum. Now that our daughter is truly a New Yorker, we have a very convincing reason to visit, and you can see a lot in just a couple of days. In all of the swarming, gritty, cacophony that is New York City there is definitely a pull. We will return.